You will notice a distinct, earthy aroma when you are roasting the beets, which is one of my favorite smells in the kitchen. This Roasted Beet, Blue Cheese Salad is a combination of your favorite lettuce, soft blue cheese, all dressed with a walnut oil vinaigrette, with just a little bit of fall in the air. Arrange the beets in a single layer on a sheet pan with parchment paper. Drizzle with the olive oil, add ½ teaspoon of salt, and the pepper, toss to coat. Roast until the beets are easily pierced with a fork, 1 hour or more, depending on their size. Set aside to cool. When the beets are cool enough to handle, remove and discard the skins with with your fingers or with a knife. Cube or slice the beets. In a salad bowl, whisk together the walnut oil, sherry vinegar and the ¼ teaspoon of sea salt. Add the lettuce and half of the beets and toss to coat well. 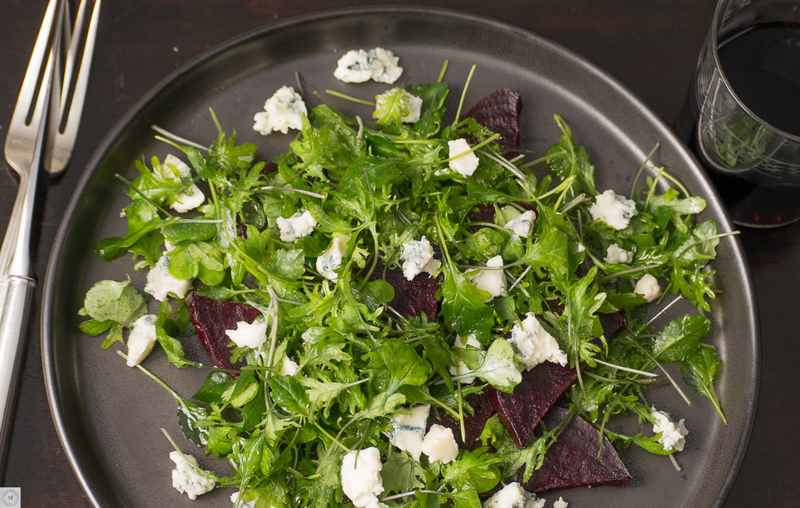 Arrange the lettuce mixture on a plate or platter and top with the remaining beets and blue cheese. Serve at once. Serve: With crusty bread or baguette.